We are proud to announce the EMERGING FOCUS [SUMMER SESSIONS] July 26-28 2013, will be partnering with photo l.a. & Aesthesia Studios, Los Angeles. This three day event will showcase over 20 seminars on a range of photography topics from the business of photography, fine art and commercial photography, tips and techniques hands on training from leading experts through to photography tours throughout Los Angeles. 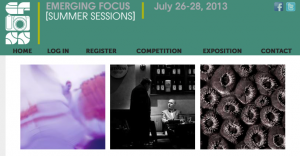 In addition, amazing evening events, tours of local fine art photography galleries, and more!